Press Release, 30th December, Abu Dhabi: Yesterday saw the grand finale of the 11th edition of the Mubadala World Tennis Championship (MWTC), hosted by organisers FLASH Entertainment. The much-anticipated event attracted the best-line up of players the tournament had ever seen, making it the one of the most exciting Championship’s in its 11-year history. Not only has the event helped to place Abu Dhabi on the map as the sporting capital of the region, but FLASH Entertainment saw its list of sponsors double this year, showcasing just how important the tournament is to the UAE. Activity today kicked off in the tennis village at midday with a series of fun-themed tennis activities and a live performance with Bait Al Oud from Abu Dhabi Classics, who hit the stage at 2pm. This was followed with autograph signing with Paris Masters champion, Karen Khachanov and South-Korean, Hyeon Chung, much to the delight of attending fans. 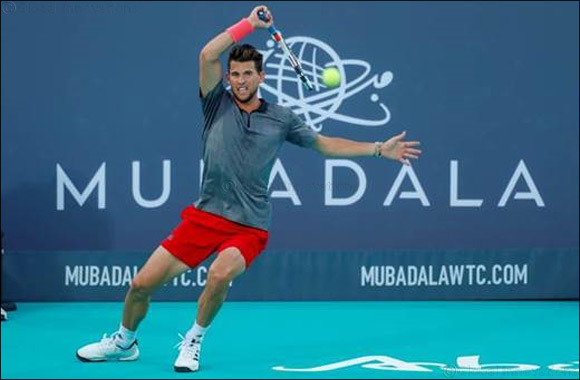 And of course, the action didn’t stop there as world number 11, Karen Khachanov took to centre court at 5pm to take on Austrian, Dominic Thiem, who stepped in for Spaniard, Rafael Nadal, who had to withdraw from the 3rd place play-off after his match with defending champion, Kevin Anderson. The current world number two explained that he felt pain after long periods without playing and his fitness was not yet where it should be, requiring additional recuperation. Despite being dubbed a ‘friendly’ match, the game allowed for some excellent viewing with the Russian, Karen Khachanov, coming up trumps. At 7pm – and much to the delight of the packed stadium, Kevin Anderson took to centre court with current world number one Novak Djokovic as the South African made a bid to keep his title from 2017’s championship. The formidable stars played some excellent tennis, with some nail-biting rallies and despite last year’s champ giving it his all, Novak Djokovic showed once again why he is the world number one – and was crowed winner of the 11th edition of MWTC, his fourth MWTC title. The tournament, now in its 11th year has earned its status as one of the most prominent sporting events in the Capital and this year, the strong calibre of players showed just that. Continuing its popular format of six male players and two female players, the latter of which was introduced last year, participating stars included: Novak Djokovic (1), Rafael Nadal (2), Kevin Anderson (6), Dominic Thiem (8), Karen Khachanov (11), Hyeon Chung (25) and seven-time Grand Slam winner, Venus Williams alongside her sister and 23 Grand Slam winner Serena Williams. But the action hasn’t just been on the court. Over the last three days, visitors have been treated to a myriad of action off-court at the Tennis Village – and the move to make the tournament more family-friendly, has clearly contributed to the success of the event. With coaching clinics hosted by Hyeon Chung, Kevin Anderson, Dominic Thiem and Karen Khachanov for young tennis fans, Q&As with Karen Khachanov and Venus Williams as well as Emirati FBMA athletes, plus a live-cooking session with chefs from Saadiyat Rotana and Kevin Anderson – and performances by FAFA (winner of the emerging talent competition) and Bait Al Oud from Abu Dhabi Classics in the Tennis Village, attendees to the tournament have been spoilt for choice – and for those who didn’t know much about the sport, MWTC has been a great platform for them to find out more. Part of Mubadala and FLASH Entertainment’s objectives are to encourage young people to get into sport – and events like this only help to mentor a future generation of stars. The tournament also saw its sponsors double in size this year – all of whom, have helped to make the last three days a huge success. Continuing its long-standing partnership was Mubadala Investment Company, who once again returned as the title sponsor of the tournament. Mubadala's commitment to the Championship also includes the Mubadala Community Cup presented by Cleveland Clinic Abu Dhabi – and these community initiatives have played a key role in the development of the game in the UAE, as well as encouraging young people to get into sport. Making their debut this Championship was luxury Swiss watchmaker, Richard Mille, who was the Official Timekeeper for the tournament. Not only are its timepieces designed to be worn in the most extreme of conditions and by the most extreme of athletes, but Richard Mille also has a long-term partnership with MTWC participant and world number two, Rafael Nadal – and MWTC was delighted to have them on board. Returning for the third time this year was German automotive manufacturer Mercedes Benz, who was the Official Vehicle Sponsor. Scottish supplier of bottled water Highland Spring, who recently announced a 100% recycled bottle, was the Official Water supplier for the second year running. Also making their appearance for the first time as supporting partner was state-owned oil company Abu Dhabi National Oil Company (ADNOC). The 11th Edition of the Championship included a further two new sponsors – Gatorade, who joined as the Official Sport Hydration Drink Partner and supported the players to stay hydrated and help improve their performance. Saadiyat Rotana was the Official Hotel Partner and looked after the accommodation needs of the tournament officials, while Wilson, who renewed their 10-year association, was the Official Ball and Racquet partner. Additional participating sponsors included: Cleveland Clinics Abu Dhabi (Official Healthcare Provider), Spinneys (Official Beverage Partner), Abu Dhabi TV (Official Broadcaster), CNN (Official News Partner), Radio One and Star FM (Official Radio Station), What’s On (Official Magazine), Expat Woman (Official Online Partner), The National (Official Newspaper) and Sports 360 (Official Sports Newspaper).